Interested in learning more about a topic in education? Gain insight, enhance your skills, and build your capacity with ASCD resources that keep the needs of the whole child in mind and connect the specific challenges of today's schools and classrooms with proven strategies. 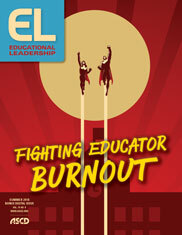 Explore strategies to help you and your staff manage stress and avoid burnout. Start your research with definitions, related terms and sub-topics, short articles, online learning opportunities, and audio or video clips featuring highlights from experts and practitioners.